One of the most important and remarkable characteristics that distinguish the physical organization of animals from that of plants, is the existence in the former of a peculiar tissue or substance called nerve. The special endowment of this substance is what is termed sensibility, or that faculty by which an animal is capable of receiving impressions from external objects, and by which consequently it is brought into relation with the surrounding world. In most animalsthis tissue is so disposed as to form a distinct and complete apparatus called the nervous system. Its development is always in direct relation to the complexity of the physical organization and the degree of physical endowment. In the lowest forms of animal creation the existence of nervous matter is as yet undemonstrated, but it no doubt exists in many species where it has not yet been discovered, owing to the delicacy of its tissues and the imperfect means of observation. The tissue out of which the nervous system is constructed presents two varieties, described by anatomists as the white or fibrous matter, and the pray, cineritious, or vesicular matter. The white matter is developed in the form of fibres or filaments, bound together in fasciculi or bundles, which consti-tute what are called nerves; their function is internuncial or conducting. The gray matter is accumulated in masses called centres or ganglia; their office is dynamic, originating the so-called nervous force. (For a more particular description of the microscopical anatomy and chemical analysis of nerve tissue, see Brain.) - Examining the nervous system in its comparative development in the animal creation, we find four principal types exhibited in the four great classes radiata, mollusca, articulata, and vertebrata. We will briefly examine these in succession. 1. Nervous System of Radiata. In this class we find the simplest form of nervous system, and one which corresponds with the simplicity of the physical organization, the animal being formed by a series of similar parts. Thus in the asterias or five-rayed star fish we have a chain of five ganglia surrounding the central mass, or body which contains the mouth and digestive cavity. These ganglia are united to each other by nervous arcs called commissures, and each sends into the ray or limb opposite to which it is placed nervous prolongations. 2. Nervous System of Mollusca. In these animals we have several separate and distinct organs, such as a digestive apparatus, a liver, gills, ovaries, and testicles, the male and female functions generally coexisting in the same animal; we have besides a muscular mantle and a foot or organ of locomotion. The necessities of this physical organization are met by a corresponding arrangement of the nervous system. Thus in aplysia there is an anterior or cerebral ganglion resulting from the junction of two above the oesophagus; this ganglion represents the brain, and is doubtless connected with whatever sensitive or volitional endowment the animal pos-sesses. From this small nerves pass to form the pharyngeal ganglion, which supplies innervation to the digestive apparatus; from this two nerves pass backward to form the pedal ganglion, which also gives nerves to supply the mantle; and in the posterior part of the body there is an additional ganglion, called the branchial, the nerves of which are distributed to the gills. 3. Nervous System of Articulata. In this class we observe that the body is divided into a certain number of similar segments, of which the anterior, called the head, pre-senta the greatest development. The nervous system in this class corresponds to their anatomical structure. Thus in the common centipede, scolopendra, the nervous system consists in a double nervous cord running along the ventral surface of the ani-mal. and presenting opposite to each articulation ganglionic enlargements; these ganglia send off lateral prolongations, which unite with each other on the upper surface of the body, forming a series of circular commissures. At the head there is a ganglion at the point of junction of the lateral prolongations from the infra-oesophageal ganglia, called the supra-oesophageal ganglion, and from this ring or collar arise the optic nerves and the other nerves that are distributed about the head. In insects we find a somewhat more complicated arrangement of the same type of nervous system, and one which presents very important analogies to the nervous system of the vertebrata. It consists in a ganglionic nervous cord, but the ganglia are arranged so as to correspond with the anatomical division of the animal into three distinct cavities, the head, chest, and abdomen. In the head we have the ganglia presiding over the functions of special sense, prehension, and mastication; in the chest those that control respiration and the locomotive organs, the legs and wings; and in the abdomen those that are connected with the digestive and reproductive functions. 4. Nervous System of Vertebrata. The nervous system, as we find it developed in the mammalia, the last and highest class of the vertebrata, consists of an axis of nerve matter, called the cerebro-spinal axis, which is enclosed in the cavities of the cranium and spinal canal. This axis is constituted of ganglia and of longitudinal and transverse commissures, and gives off nerves which are distributed to the organs of special sense, of ordinary sensation and motion. This cerebro-spinal axis, however, with its centres, commissures, and nerves, forms but one portion of the nervous system in the vertebrata, that which presides over the purely animal functions of locomotion, respiration, sensation, and intelligence. A separate and distinct system, called the ganglionic or sympathetic, controls the functions of organic or vegetative life; its centres are located in the visceral cavities of the body; they are connected with each other by longitudinal and transverse commissures, and send filaments to all the viscera. The cerebro-spinal axis, as it is developed in man, may be briefly described as follows. The principal ganglion is placed at the superior extremity of the axis, and is called the brain or en-cephalon. This is enclosed in the cavity of the cranium, and is enveloped by three membranes, the pia mater, the arachnoid, and dura mater. The encephalon consists of a series of ganglia connected with each other, and designated, counting from before backward, as: 1, the olfactory ganglia; 2, the cerebrum or hemispheres; 3, the corpora striata; 4, the optic thalami; 5, the tuber-cula quadrigemina; 6, the cerebellum; 7, the ganglion of the tuber annulare; and 8, the ganglion of the medulla oblongata. 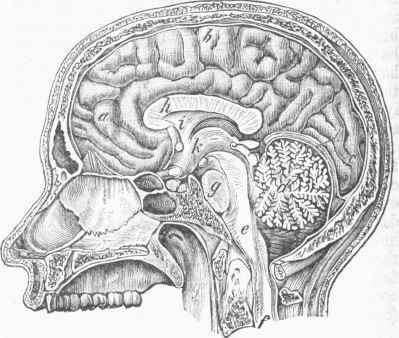 The cerebrum and the cerebellum present a convoluted surface; the others are smooth and irregularly rounded. The superior aspect of the brain presents a deep longitudinal fissure, which divides the cerebrum into two lateral halves, called the cerebral hemispheres; these hemispheres, however, are united at their middle by a transverse commissure, designated as the corpus callosum. Upon its inferior surface each hemisphere is seen to be divided into an anterior, middle, and posterior lobe. The remainder of the axis, called the spinal cord, is a cylinder of nerve matter, extending through the entire length of the vertebral canal, where it is enveloped by a prolongation of the membranes of the brain. Upon the anterior and posterior aspects of the spinal cord are two longitudinal fissures, which indicate the two lateral halves of which the organ is composed. From the brain and spinal cord there arise 44 pairs of nerves, perfectly symmetrical in their course and distribution. These nerves are distinguished as cranial and spinal. The Brain enclosed in its Membranes, and the Skull. a, b. c. Convolutions of the cerebrum, d. Cerebellum, e. Medulla oblongata. f. Upper extremity of the spinal cord. g. Tuber annulare, h, i, k. Central parts of the cerebrum. The Spinal Cord and Nerves, posterior view. a- Upper extremity of spina] cord. 6. Lower extremity. This diminution in the size of the brain in the lower vertebrata is observed chiefly in the cerebral hemispheres, the centres of the intellectual faculties. A few words will describe some of the more important anatomical differences in the cerebro-spinal axes of the three lower classes of vertebrata. The brain of birds presents a perfectly smooth surface, and is composed of six masses, viz., beginning anteriorly: the two lateral hemispheres, the optic tubercles, the cerebellum, and the medulla oblongata. The cerebellum is compressed laterally and convoluted transversely. The brain of birds has in common with reptiles and fishes certain peculiarities never observed in the brain of mammalia. They are: 1, the absence of the corpus callosum or transverse commissure of the cerebral hemispheres; 2, the separation of the optic tubercles from the hemispheres; and 3, the existence of two ventricles in the optic tubercles. In reptiles, as in birds, the brain is without convolutions. The optic tubercles, instead of being smaller, are sometimes larger than the cerebral hemispheres, and placed as usual behind them. The cerebellum is behind the optic tubercles, and is generally small. The olfactory nerves are apparently continuous with the anterior or cerebral ganglia. The brain of fishes is composed of lobes placed one behind the other so as to form a sort of knotted cord. The optic tubercles, called also tubercula quadrigemina, and the cerebellum, placed behind the cerebral ganglia, and are larger in proportion to the latter than in reptiles. The spinal cord differs essentially in the different classes of vertebrata only in the number of pairs of nerves which arise from it, this number being always proportioned to that of the vertebra?. - Functions of the several parts of the Nervous System. The first question that meets us in this inquiry is: What are the vital endowments of nerves and nervous centres? When we expose and irritate a nerve by chemical, mechanical, or electrical stimulus, we observe no visible change in the nerve itself, but we produce indications of pain and contraction of the muscles to which the nerve is distributed. We infer therefore from the effects of the irritation that it has produced some change in the nerve, or excited in it some vital endowment. This change has been compared to that wrought in a piece of malleable iron by the galvanic current; and the analogy has suggested the term polarity or polar force, as applicable to the condition produced in nerves by the application of a stimulus. This property of nerves, by which they respond to external irritation, producing pain or muscular contraction, is called irritability; and one of its most remarkable characteristics is the instantane-ousness with which the effect follows the irritation. This irritability or nervous force, as it is also called, can be excited at the centres and extremities as well as in the course of the nerves. The effects of irritation vary considerably, however, in different parts of the nervous system. There are certain ganglia and nerve, the irritation of which produces effects that are entirely peculiar to themselves. Thus, irritation of the optic tubercles or nerves causes the sensation of light, irritation of the auditory nerve gives rise to the sensation of sound, and irritation of the olfactory and gustatory nerves to the sensations of smell and taste. This difference in the effects produced by the irritation of different nerves is the basis of the division of the nerves into: 1, motor nerves, or those in which irritation produces muscular contraction: 2. sensitive nerves, or nerves of common sensibility, in which irritation is followed by an agreeable or painful feeling, according to the nature or degree of the stimulation; and 3, nerves of special sense, in which irritation excites the peculiar sensations of light, sound, taste, etc. Many sensitive nerves arise from nervous centres in such close proximity to motor nerves, that a stimulus applied to the former will react upon the latter, and produce not only a direct sensation, but what is technically called a reflex action. This property of reflection was supposed by Marshall Hall to reside in special nerves which possessed both an incident and a reflected fibre, or, as they are called, an afferent sensitive nerve leading to the centre, and an efferent motor nerve coming from the centre; these nerves he styled excito-motory. Probably the majority of all the nerves in the body are compound in their constitution; i. e., they are formed of sensitive and motor filaments combined in the same sheath, or fibrous covering, called the neurilemma. There is no appreciable difference to the eye in the structure of sensitive and motor nerves. The difference in their endowments can only be ascribed, in the present state of our knowledge, to the different nature of their central or peripheral connections. It is a remarkable fact that whatever part of a sensitive nerve be irritated, whether it be the centre, the middle, or the extremity, the same sensation will be produced. There are many familiar illustrations of this fact. For years after the amputation of limbs, patients will experience the sensation of fingers and toes; and when the trunk of a nerve is irritated, they will complain of pains or tingling in the extremities. The same law applies to nerves of special sense. Ordinarily their peculiar irritability is excited by stimuli applied to the periphery or ultimate distribution of the fibres; but occasionally, in consequence of disease, we have these special sensations caused by stimulation applied at the centre or origin of the nerves. Thus, disturbance of the circulation in the brain, or the existence of tumors or other local disease in the neighborhood of the centres of the nerves of special sense, gives rise to optical illusions, singular noises, disagreeable odors, etc. The stimuli that excite the nervous force or irritability are of two kinds, physical and mental. Physical stimuli embrace all external excitants of whatever nature - light, heat, sound, odor, and every variety of chemical, mechanical, and galvanic irritant. Mental stimuli result from the exercise of the will and thought. In all voluntary movements the mind is the direct stimulus of the motor nerve; and in certain deranged states of the nervous system, as in hysteria, the mind also seems to affect directly the nerves of sensation so as to excite pain. Motor nerves are never directly excited by physical stimuli. The latter act always on motor nerves through the medium of sensitive nerves, and, as before stated, the actions so produced are termed reflex actions. The most remarkable of the physical stimuli, and the one most analogous in its effects to the stimulus of the will, is galvanism. The effect of this stimulus is muscular contraction, and there are certain peculiarities in its mode of action that are worthy of mention. 1. If the current be made to cross a nerve at right angles to it, no effect is produced; but if it be made to pass along the fibre, for the smallest fraction of an inch, it will excite more or less violent contraction of the muscles to which the nerve is distributed. 2. These contractions occur at the moment of making and breaking the current, and not while it is passing. 3. When the current is made to pass from the centre toward the periphery, it is called the direct current; when from the periphery toward the centre, the inverse current; and it is observed that contractions occur at the moment of making the direct current, and at that of breaking the reverse. 4. Continuance of the direct current exhausts the power of the nerve, but the reversal of the current will restore it; hence the value of the interrupted current, obtained from the electro-magnetic machines, as a remedial agent. - Nature of Nervous Force. We can judge of the nature of the nervous force only by its effects. The muscular contraction caused by the irritation of a nerve is due to the development of a peculiar vital force in the nerve structure, which is unlike any of the known physical forces. It bears certain analogies to electricity, and by some authors has been supposed to be identical with it. The reasons for this supposition are: 1, the identity of their effects on muscular fibre; 2, the rapidity of their action without producing any appreciable effect on the parts between the point of irritation and the point affected; 3, the extreme sensibility of nerves to the electric current; and 4, the phenomena of electrical fishes. None of these reasons are sufficient to establish the identity of the nervous and electrical forces, while the experiments of Longet, Matteucci, Prevost, Dumas, and others, showing that the more delicate tests can detect no galvanic current in the nerves, and that they are inferior to some other substances as conductors, prove conclusively that they are essentially distinct and different forces. With regard to the indisputable electrical phenomena that are observed in the torpedo and gymnotus, it is well ascertained that they depend on the existence in these animals of a special organ which generates electricity. The function of nerves, as has been remarked, is internuncial. They possess only limited capacity for the development of nervous force. Their office seems to be to conduct sensations from the periphery to the centre, and impulses from the centre to the periphery. Their connection with a centre is essential for the appreciation of external impressions or the exercise of mental stimulus. The determination of the sensitive or motor character of a nerve is effected by direct experiment on living animals, and by the effects of disease or injury of the nerves. The different properties belonging to the two roots of the spinal nerves were discovered by Sir Charles Bell about 1810, and established by Magen-die in 1822. Magendie operated by dividing, in the living animal, first, the posterior roots of the lumbar and sacral nerves, after which sensibility was lost in the corresponding limbs, while the power of motion remained; secondly, the anterior roots only, after which the power of motion was abolished, but sensibility remained; and finally, at the same time both anterior and posterior roots, after which motion and sensibility were alike destroyed. These experiments have been repeated by numerous observers, and the conclusion is established that the anterior root of each spinal nerve is motor and the posterior sensitive. (For a description of the functions of the encephalic nervous centres and the cranial nerves, see Brain.) - Functions of the Spinal Cord. The spinal cord consists of two anterior and two posterior columns made up of longitudinal nerve fibres. Each lateral half encloses a crescentic mass of gray vesicular nerve matter. The fibres of the spinal nerves originate from the gray matter within the cord, while others extend longitudinally through the cord, and are connected, either directly or indirectly, with the brain. The discovery of the separate function of the roots of the spinal nerves was the first step in unravelling the important offices of the spinal cord. Experiments on living animals have established the following points in its physiology: 1. That the anterior and posterior columns of the cord correspond in their properties to the anterior and posterior roots of the spinal nerves; for when the anterior column is irritated, convulsive motion is produced in the parts below the point of division; and when the posterior column is irritated, a painful sensation is produced. 2. When the anterior and posterior columns are both divided, it is found that irritation of the portion of the anterior column attached to the brain produces no effect, while irritation of the lower segment causes convulsive action, showing that in the anterior column the nervous force travels from within outward and not from without inward. When, on the other hand, the portion of the posterior column attached to the brain is irritated, pain is produced, while irritation of the portion below the division causes no pain, showing that in the posterior column the nervous force travels from without inward and not from within outward. 3. The motor nerves derived from the right side of the body enter the right lateral half of the cord, and make their connections from below upward on the same side until they reach the medulla oblongata, where they cross over to the left side; the same course is followed by the motor nerves of the opposite side, which pass up the left anterior column till they reach the medulla, when they cross to the right side. This crossing of the motor nerves in the anterior columns of the medulla is termed decussation. The consequence of this arrangement is, that when an injury is inflicted on the right half of the anterior column below the medulla oblongata, the paralysis is on the same side; but when the injury is above the point at which decussation commences, the paralysis will bo on the opposite side. 4. The experiments of Dr. Brown-Sequard show that there is a crossed action in the sensitive as well as in the motor fibres of the cord. The decussation of the sensitive fibres, however, exists through the entire length of the spinal cord, and not in the medulla alone, as in the anterior columns. The effect of this is shown when one lateral half of the spinal cord of a dog is divided; sensation remains on the corresponding side of the body, but is lost on the opposite side. - Reflex Action of the Spinal Cord. Thus far the spinal cord been considered as a bundle of sensitive and motor nerves connecting the brain with the muscles and periphery of the body; but we find that the central portion of the cord contains a considerable' amount of gray matter, and that it possesses in consequence the capacity of a nervous centre. When a frog has been decapitated, sensation and volition are of course destroyed, the communication between the body and the centres in which these powers reside being cut off; but it will be found, nevertheless, that irritation of either lower or upper extremity will be followed by muscular contraction on the corresponding side; and when the irritation is excessive, contractions will occur in all the limbs. These phenomena, which are due to the action of the cord as a nervous centre, are not unfrequently observed as a consequence of disease or injury of the spinal cord. Whenever communication is cut off between any portion of the cord and the brain by disease, such as softening, or by fracture of the spine, sensibility and the power of motion are lost in the parts below the point of disease or injury; but involuntary and uncontrollable contractions occur in response to any irritation applied to the surface, such as tickling of the soles of the feet, a draft of air, or the application of the galvanic current. For the production of these reflex phenomena it is necessary: 1, that the cord be in a state of integrity; and 2, that the continuity of the spinal nerves be unbroken. If the spinal cord be broken up in the frog by the passage of a needle through the spinal canal, irritation of the extremities will produce no effect; and if the sciatic nerve, for example, be divided, the cord remaining perfect, no contraction can be produced on the side of the division. It is inferred then from direct experiments and from the evidence furnished by disease that the spinal cord is a nervous centre, which supplies innervation to the muscular and cutaneous Bystems through the medium of sensitive and motor filaments; the sensitive filaments con-veying impressions from the surface to the centre, and the motor filaments transmitting impulses from the centre to the surface. - Sympathetic or Ganglionic System. This system, which is sometimes called the nervous system of organic life, consists in a double chain of nervous ganglia occupying the visceral cavities of the body, and extending along the front and sides of the vertebral column from its anterior to its posterior extremity. There are four symmetrical pairs of ganglia in the head, three pairs in the neck, ten pairs in the chest, an irregular aggregation of ganglia in the abdomen called the semilunar ganglion, and five pairs in the pelvis. These ganglia are all connected with each other by transverse and longitudinal commissural fibres, and they send off some filaments to join nerves from the cerebrospinal system, and others to be distributed to all the viscera which are concerned in the maintenance of organic or purely vegetative life. The state of knowledge concerning the special properties and functions of the sympathetic system of nerves is less advanced than that which relates to the cerebro-spinal system. The reasons for this imperfect knowledge are, the difficulties of experimenting on this system from the peculiarities of its situation, and the very complex connections of the sympathetic and cerebro-spinal systems. - For further information, see Longet, Anatomie et physiolo-gie du systeme nerveux (1842), and Traite de physiologie (1850-'70); Mayo "On the Nervous System" (1842); Carpenter, "Principles of Human Physiology" (1846; 7th ed., 1869); Todd's " Cyclopasdia of Anatomy and Physiology;" Todd and Bowman, "Physiological Anatomy and Physiology of Man" (1850); Bernard, Legons sur la physiologie et la patho-logie du systeme nerveux (1858); Vulpian, Legons sur la physiologie generate et comparee du systeme nerveux (1866); Dalton, "Treatise on Human Physiology" (1859; 5th ed., 1871); Flint, "Physiology of Man," vol. iv. (1872); and other systematic works on physiology. - Nervous Diseases are properly divided into the functional and structural diseases of the nervous system. The functional diseases are those in which there is no morbid change or lesion in the nerve structures to account for the symptoms; they manifest themselves by irregular, depressed, or exalted conditions of the pecular functions of the nervous system, viz., sensibility and motion. They may be enumerated as follows: 1. The numerous varieties of neuralgia which are independent of disease of the nerves or their centres. 2. The various forms of insanity, as delirium, monomania, dementia, and general paralysis, where no morbid change occurs in the brain to account for the symptoms. 3. The protean nervous phenomena, neuralgia, paralysis of sensation and motion, convulsions, and the various exhibitions of mental and moral perversity, constituting the disease known as hysteria. 4. Delirium tremens, that derangement of the nervous functions, manifested by optical illusions, hallucinations, mania, and muscular trembling, which arises from exhaustion of the nervous power produced by prolonged stimulation by alcohol. 5. Chorea or St. Vitus's dance, an affection occurring generally in young girls between the period of dentition and puberty, and consisting in irregular contractions of the voluntary muscles. This disease has been graphically termed "insanity of the muscles." 6. The convulsions and paralyses that occur in infancy and childhood from the irritation of teething or from gastric and intestinal derangements. 7. Tetanus or locked-jaw, a rigid spasm of the voluntary muscles arising from an exalted state of the reflex function of the spinal cord, sometimes spontaneous, but more often the result of punctured or lacerated wounds. 8. The rare and curious derangements known as catalepsy and ecstasy. It is doubtful whether in all these cases structural disease of the nervous tissues do not really exist, and may not be discoverable by more complete examination. Accounts of these diseases will be found under appropriate heads. Structural diseases of the nervous system, or those in which the nervous symptoms arise from some morbid change or lesion in the nerve structures, may be divided into: 1, diseases of the brain and spinal cord and their coverings or membranes (see Brain, Diseases of the); and 2, diseases of the nerves. The latter are not numerous. (See Neuralgia.) Epilepsy, sometimes a purely functional disease of the nervous system, and sometimes organic in its origin, is described under its own head.